We hit the coveted perfect round in round five of the BBL08 season and while round six hasn’t exactly gone to plan just yet, we will look to soldier on today as we begin our Round 7 preview! Note: We will start our Round 7 previews by taking a look at the Stars and Scorchers game on Wednesday night, we’ll continue to add more games throughout the week when teams have completed their previous games. After starting the season by losing their first two games, the Melbourne Stars have bounced back to win their last three in a row against the Sixers, Renegades and Thunder respectively. They’ll be praying they can get their fourth win on the board on Wednesday night against the Perth Scorchers without four of their key players in Glenn Maxwell, Marcus Stoinis, Adam Zampa and Peter Handscomb, who all depart for Australian ODI duties. What a disappointing start to the season it’s been for the Perth Scorchers. They have won just one of their six games to date and currently sit last on the BBL table after losing to the Brisbane Heat on Saturday night. They too will lose some key players to international duty for Wednesday night’s game against the Stars in Jason Behrendorff, Jhye Richardson and both Shaun and Mitch Marsh. The Scorchers batting line-up has been an absolute joke so far, this BBL season and with no real possibility of getting Shaun Marsh back as well as the potential to lose Mitch for some upcoming games, it creates real selection problems. The Stars have looked fantastic over their last three games with a spin to win approach backed up by some quality overs from their all-rounders. We think they should be far too good for the Scorchers at home. The Brisbane Heat were victorious via the Duckworth Lewis method in their last matchup against the Sydney Thunder on Tuesday night. The win is their second in a row after losing their opening three games and the dynamic pair of Brendan McCullum and Chris Lynn were fantastic, both notching up hald centuries in the win. The Melbourne Renegades proved that Marvel Stadium is becoming a fortres of sorts for them as they became the first team in BBL08 to defeat the Hobart Hurricanes. After bowling first and claiming the key early wickets of both Matthew Wade and D'Arcy Short, the Renegades were able to restrict Hobart to just 145 despite a brilliant 70 from George Bailey. Aaron Finch proved a vital inclusion in the Renegades lineup, top scoring with 42 as the Gades chased the total in the last over. The Heat batting lineup seems to have come to life over the last few games, so it'll be very hard to bet against them at home where they have traditionally been so good. A lot will come down to the toss in this game, the team who wins should bat first and set a high total, but there has been some fragility in the Renegades lineup and Finch will be back out on Australian ODI duty. Back the Heat here. It was a disappointing loss at home on Wednesday night for the Melbourne Stars, who made just 146 off their 20 overs batting first against the Perth Scorchers. The Stars were unable to stop Cameron Bancroft and Ashton Turner, who made 102 runs between them to breeze past the Stars total in the 18th over. The Stars line-up looked in tatters without four of their key players in Maxwell, Stoinis, Handscomb and Zampa and will have to make do without them again on Friday against the Strikers. The Strikers will also have a few key players out with Australian ODI duty. Alex Carey, Peter Siddle and Billy Stanlake will all miss Friday night's game, leaving the bowling stocks for the Stirkers a little thin. However, they will have the benefit of playing this game at home, where they have been fantastic over the last few seasons. With Carey out of the line-up a lot of the scoring responsibility will rest on Jake Weatherald and skipper Colin Ingram. It's hard to like the Stars line-up at the moment without the four experianced players, we learned that on Wednesday night when they were comfortably beaten by a Scorchers team that has had their own problems in BBL08 so far. At home, we think the Strikers should be able to get the job done. The Thunder and Strikers kick off a massive BBL triple header on Sunday and finish off Round 7 of the season. The Strikers were victorious over the Stars on Friday night and will be back in action in the very next scheduled game beginning at 2.45pm Sunday. After batting first and compiling a fantastic total of 178 at the Adelaide Oval, the Strikers went on to bowl the Stars out for just 137 in 19.2 overs. The win sends them to second on the ladder with a 4-3 record through 7 games. After a decent start to the season which currently sees them in 6th place with a 3-4 record, the Thunder will now wave goodbye to the star English duo in Jos Buttler and Joe Root as the pair embark on their international tour of the West Indies. English bowler Chris Jordan and New Zealand batsman Anton Devcich will replace Buttler and Root for the second half of the season but regardless of replacement, the departure of Jos Buttler from the top of the order will leave a gaping hole. The Strikers start as slight favourites away from home and we are siding with them here. They have found some good form over the past few games and the inclusion of Travis Head back into the side, albeit at the expense of Alex Carey, strengthens both the batting and the bowling line-up. We think they get the job done here over a new look Thunder team. 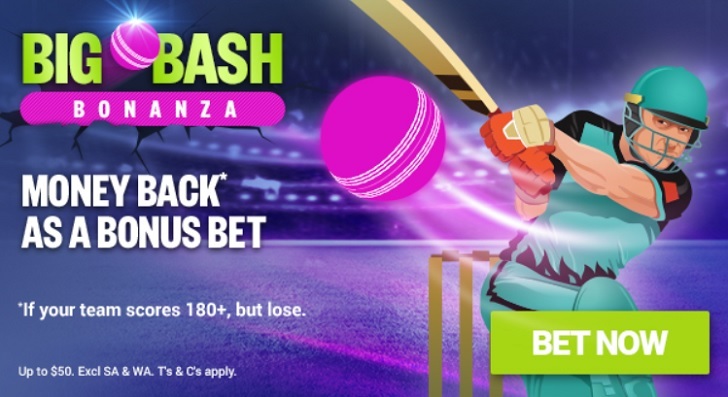 The Big Bash League has arrived, and so have a great range of BBL08 betting markets and promotions at the Australian sports betting sites. Ladbrokes are the one of the largest sportsbooks in Australia and offer a huge range of sports betting markets. It doesn't matter how obscure the sport, Ladbrokes have your markets covered! They also have some of the best promotions around, including some amazing offers for the new Big Bash League season! For every match of the BBL08 season, you can bet on a six to be hit in the first over and receive excellent odds of $10! Sign up to Ladbrokes through the links here on Before You Bet and you'll also be eligible for an exclusive first deposit bonus of up to $500! But hurry, as this offer is available for a limited time only! Click here to join Ladbrokes today! Place a head to head bet on the BBL this season and if your selection scores 180+ runs but loses, get your money back in bonus bets up to $50! Palmerbet also offer a fantastic $500 first deposit bonus when creating a new account! Sportsbet are one of Australia's largest sportsbooks, and offer punters an enormous range of betting markets and promotions including the fantastic feature multis in BBL08 matches! New customers to Sportsbet can also enjoy one of the country's best bonus offers - a 100% matched first deposit bonus up to $500! For something a little different this Big Bash League season, why not try Daily Fantasy Sports? Draftstars are Australia's largest DFS provider and run a heap of different contests for every match of the BBL08 season. The highlight of BBL08 will be the $150,000 Guaranteed Big Bash Live Final which will run at the end of the season. Qualifiers are running daily and cost just $2 to enter! If you win a qualifier, you'll be flown to Melbourne for the live final at Crown Casino and the chance to win the top prize of $50,000!